This text by PATRICIA REED is published along side HADLEY + MAXWELL‘S “who can resist a Human? who doesn’t finger lies?” exhibition. An aphoristic praxis. It has been said of the aphoristic style of writing that it at once declares and simultaneously remains open for experiential reflection, overflowing the bounds of linear convention that demand a progression from introduction to conclusion. Aphorism is a-conclusional (and not inconclusive) in structure, an unsystematic form with no determinate destination, driven by a certain freedom in performing a poetical conjecture conferring multiple perspectives even oppositional ones. Translated into a visual language, aphorism takes on Cubist traits, exploding the familiar limit-contours of objects into multiple planes not representing an object, but rather the concept of the object, irreducible to the properties of its mode of appearing to the senses. In their latest installation of cut-up of disfigured statuettes and accumulated objects of varying significance, Hadley+Maxwell have embraced the spirit of aphorism. Composed of fragments, interrupted surfaces and separations, the duo take up the timeless perplexities of human self-definition with whimsical experimentation. A Chemistry of Concepts and Sensations [i], the title of Nietzsche’s first published aphorism, is a fitting metaphor for the exhibition. Theirs is a mingling of thought and form that wrestles with the double potentiality of chemistry itself: both the study of properties of substance and an unclassifiable relation of inclination from one thing to something else. The sense of sense. The sprawling installation of cultural detritus from Hadley+Maxwell enacts visual-aphorism as method recalling that methodos (Gk.) is not a schematic operation, but simply a path, a course from one thing to something other, a transformative translation. To cut, to interrupt, to decorate and to re-assemble are paths of translation in the staging of an ornate after-life of once discarded objects, dis-identifying the appearance of common properties of things. Is a figure still a figure without a face? 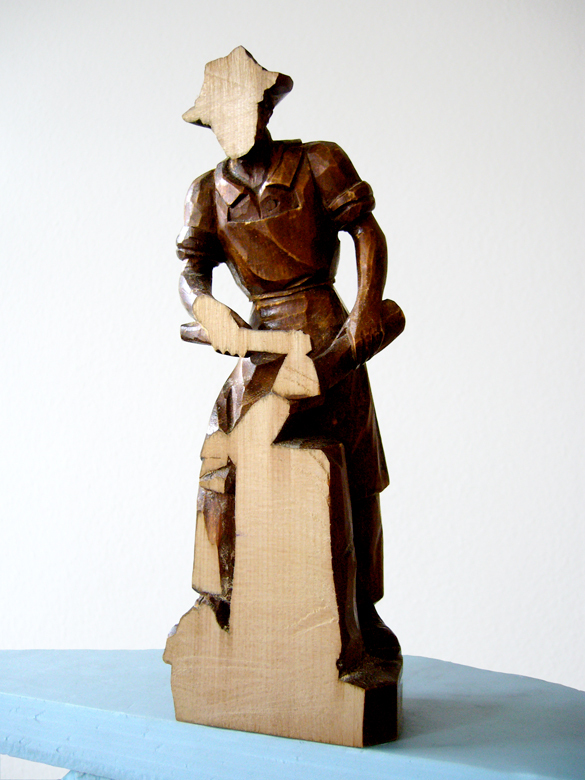 Why does the faceless wooden figure resonate so violently compared with a piece of cut-up kindling? Simply put, because we believe in the appearance of the image (nothing speaks to this more than our belief in the image of currency an abstraction turned real). To cut is to separate, yet cutting also creates the possibility of new, uncommon associations and agglomerations of things beyond familiar properties and modes of classifiable identification. Just like the aphorism, whose own path is abrupt and indeterminate, its syntax emerges from the spacing of fragments a spacing that both separates and relates divergent positions and statements, occupying an aporetic sphere, a sphere of logical impasses infused by doubt. Unlike filmic montage, however, whose image cuts serve to direct the viewer towards an emergent meaning, the aphoristic praxis of Hadley+Maxwell cuts through the figuration of meaning, or sense itself revealing the symbolic contingency through which the distribution of sense (the sense of sense) comes into operation. Thresholds of speech and voice. The clearly delineated plane of separation between the quasi-figurative and decorative forms, uncanny man/animal grotesques and stacked objects, is articulated through the alignment of things drawing out a tangent in negative space, through the near-abutment of proximity. The mode of separation between the two sides of figurative stacked-sprawl is notable for there is no inside nor outside there is utter separation, without the sensibility of belonging or not belonging. Such a separation embodies the existence of a threshold, not the mapping of a limit, but the experience of the limit itself, the experience of being simultaneously within its parameters and outside of its bounds. This conflict of conventional reason is not an inconsequential affair. When the bar is raised to questions of human life, which has never been, a priori, defined, the schema or imagination of the human comes to the fore. Our schema of human-ness, of life itself, has been carved out through a series of separations separations between vegetal and relational, organic and animal, animal and human. [iii] We can add to this list the separation between speech and voice, which was Aristotle’s distinction between the human as distinctly political and the animal as merely expressive. The prevalence of separation, of the decision to cut, in Hadley+Maxwell’s installation plays within these apparatuses of distinction-making distinctions that take us beyond the debates on the rights of humans (or animals and plants for that matter) to the very sense (and not proper essence) of human-ness itself. A human-ness whose sensibility has been pronounced through politics as a separation device, (mere life from good’ life, physiological life from civic life), theirs is a propositional human-ness inhabiting a threshold between speech and voice. The bond between logos and mythos. That which is chiasmic is defined by the character X’, signifying a crossing of thought, a togetherness of being apart with preponderance for a paradoxical unity of oppositions. X’ delves into the relationality imparted by separation the inherent irony, or illogic of separation, and is precisely where Hadley+Maxwell have positioned us as viewers. Chiasmic is the adjective that sets the tone of the installation at once charged with a philosophical rigour that conceptually scaffolds a material enunciation radiating with child-like playfulness. Their chiasmic tendencies lie in the conjunction of reason and allegory, of logic and myth, ignoring the perceived gaping crevice of these seeming dichotomies and traversing a path of separation that links them together in the schematic shaping of a potential, improper human. PATRICIA REED is an artist based in Berlin. Her practice reflects on the structures of co-habitation and the playing out of disagreement and misunderstanding therein. Reed has exhibited internationally and her texts have been published in C Magazine, Fillip, Framework: The Finnish Art Review, Art Papers, Shifter Magazine and in a forthcoming anthology entitled Cognitive Architecture: From Bio-politics to Noo-politics (010 Publishers, 2010). [i] Nietzsche, Friedrich. Human, All Too Human, trans. R. J. Hollingdale. Cambridge: Cambridge University Press, 1997, 1, p.12. [ii] Giorgio Agamben, The Coming Community, trans. Michael Hardt. Minneapolis: University of Minnesota Press, 1993, p. 86. [iii] Agamben, Giorgio. The Open: Man and Animal, trans. Kevin Attell. Stanford: Stanford University Press, 2004, p. 15. Hadley + Maxwell: who can resist a Human? who doesn't finger lies?